Ladies, Gentlemen, and all those in between – welcome to the 1st Annual DUHC Celebrity Costume Awards, hosted by yours truly! Originally, I was going to play a bit of Spooky Season fashion police and rank the best and worst costume choices, but if our Lord and Savior, Harry Edward Styles, taught me anything, it’s to Treat People With Kindness. Which caused me to feel guilty about ranking the worst costumes because I mean, they still made an attempt, right? And that is more than I can say with my choice to dress up as (drum roll please), My Future. So, grab your candy corn and get settled in because this frightening morning/afternoon/evening (circle one) is going to be filled with some of the most spine-tingling, ghoul-tastic costumes! Will your favorite celebs be going home with a prestigious Spooky Statue ™? It’s time to find out! Joey King! Joey had to shave her head for an upcoming role in a film, but she didn’t let that get in the way of her Halloween festivities. The hilarious and talented actress capitalized on her newfound hair style and transformed herself into Voldemort, and I LOVE it! Camila Mendes and Lili Reinhart! The Riverdale co-stars embodied their inner Idaho high schoolers and went as Pedro and Napoleon Dynamite, which is arguably the most iconic and comedically genius duo in film history. Try and change my mind, I dare you. Gosh! John Legend AND his daughter, Luna. John was decked out as Prince Charming, while Luna was a beautiful princess ready to be carried away to the ball in a pumpkin carriage. Erm, well, it’s Halloween so…Jack-O-Lantern carriage? Maybe? I don’t know. Let me know the correct terminology via MySpace direct message. Rita Ora! The English singer went as no other than a fellow music industry member, the happy-go-lucky, Post Malone! I am no stranger to making sure my admiration for gender bent costumes is known to one and all, and that won’t stop now! Every detail of this look was executed brilliantly. From the face tats, to the outfit, to even walking with Post’s swagger – Rita had it all! Perrie Edwards! 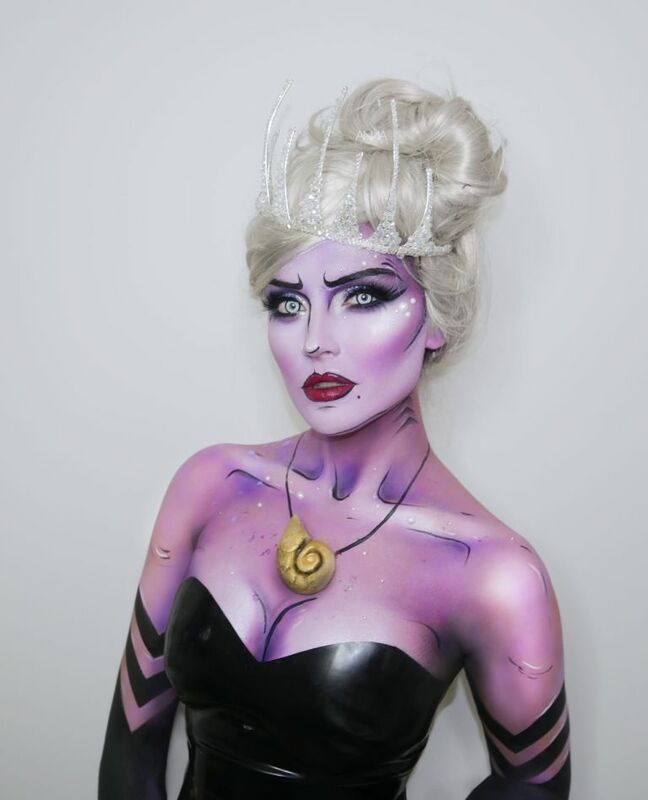 The Little Mix singer went as everyone’s favorite under-water villain, Ursula. And, might I just say, I feel bad for any poor unfortunate soul who tried to show up at the same event as any other Disney character because Perrie would blow them out of the water…no pun intended. None other than our Lord and Savior himself, Harry Styles, who went as Elton John! Now, I may be just a tad bit biased but there was absolutely no way Harry would not make this list. Now cue my inner TV infomercial person because WAIT THERE’S MORE. Not only did Harry sport this iconic glittery jersey, but Elton John wore that on October 26th while performing at Dodgers Stadium in 1975, and Harry wore this on October 26th, 2018 at a Halloween party, at the SAME TIME the Dodgers were playing in the World Series. I’m not saying Harry is a fashion intellectual, but well…you can do the math. As stan twitter says, Harry outsold with this look. Thank you all for joining in on the 1st Annual HCDU Celebrity Costumes Award Ceremony! Hopefully, by the 2nd Annual Celebration I’ll have come up with a wittier name. Happy Halloween!